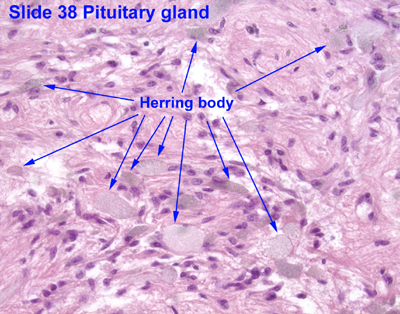 Herring bodies or neurosecretory bodies are structures found in the posterior pituitary. They represent the terminal end of the axons from the hypothalamus, and hormones are temporarily stored in these locations. They are neurosecretory terminals. Antidiuretic hormone (ADH) and oxytocin are both stored in Herring bodies, but are not stored simultaneously in the same Herring body. In addition, each Herring body also contains ATP and a type of neurophysin. Neurophysins are binding proteins, of which there are two types: neurophysin I and neurophysin II, which bind to oxytocin and ADH, respectively. Neurophysin and its hormone become a complex considered a single protein and stored in the neurohypophysis. Upon stimulation by the hypothalamus, secretory granules release said hormones into the bloodstream. Fibers from supraoptic nuclei are concerned with ADH secretion; paraventricular nuclei with oxytocin. This anatomical structure was first described by Percy Theodore Herring in 1908. ↑ Kwang W. Jeon (18 August 2005). International Review of Cytology: A Survey of Cell Biology. Gulf Professional Publishing. pp. 143–. ISBN 978-0-12-364649-1. Retrieved 26 May 2011. ↑ Mescher, Anthony L. (2013). Junqueira's Basic Histology: Text and Atlas (13th ed.). McGraw-Hill Medical. ISBN 978-0071780339.